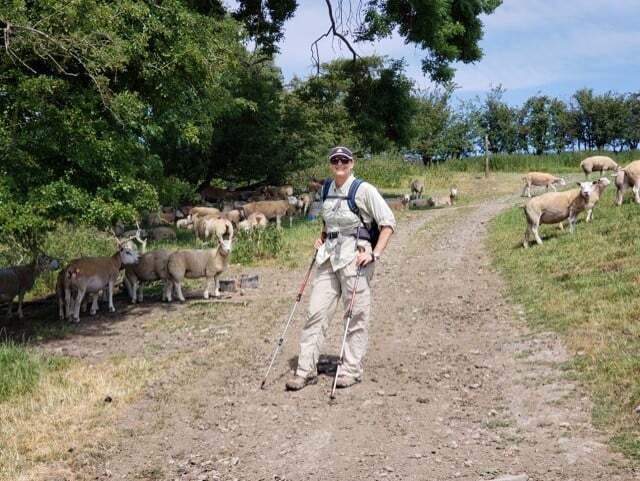 This is a guest article written by one of our walkers on the Offa’s Dyke Path, Suzanne Schlosberg. A while back I became obsessed with “Hinterland,” a BBC drama about a brooding detective exiled to a Welsh coastal town where nobody smiles. Wales, as depicted in the show, was dreary, cold, grim. In other words: awesome. To me, anyway, given my aversion to anything hot or bright. Hot tubs, saunas, Florida, August — all of it zaps my energy. As I binged “Hinterland” on the bike in our dark basement, I grew transfixed by Wales. The gutteral language and Celtic names (Gwylim, Ffion, Delyth!). The empty roads and driving rain. The gloom! Wales struck me as the ideal destination for summer, when everyone in our relentlessly sunny Oregon town would be mountain biking, kayaking, or floating the river on giant inflatable mattresses. I should note that my husband, Paul, enjoys summer. He rides our trails and owns a raft. Also, he quit “Hinterland” after two episodes. Happily, I found a Welsh destination I thought we’d both enjoy: the Offa’s Dyke Path — Llwybr Clawdd Offa. 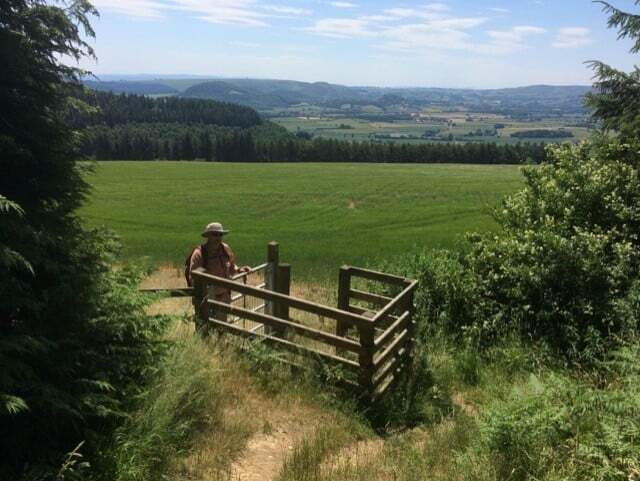 Part of the British National Trails system, the Offa’s Dyke Path traverses a hilly region of sheep farms, bucolic villages, and medieval castle ruins. 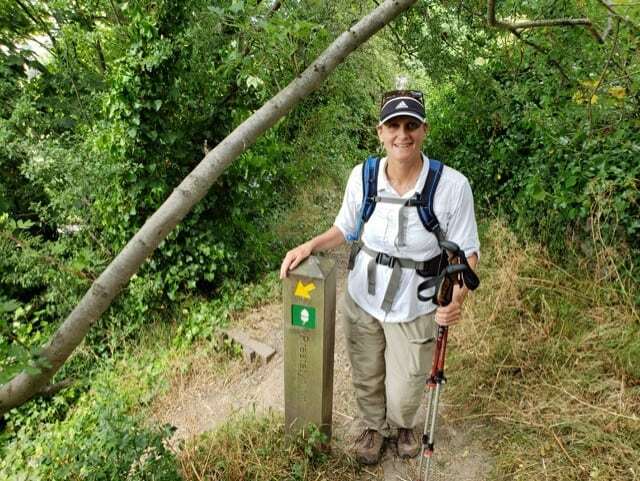 For Paul, an avid backpacker, our 12-day trek would provide the requisite amount of nature and mileage. I’d get to escape the July heat, hear Welsh spoken, and enjoy an outdoor adventure without sleeping in a tent. Celtic Trails would arrange our B&B stays and luggage transport. The cherry on top: from the trail’s end, at the Irish Sea, we’d board a train to Aberystwyth, the bleak seaside town where “Hinterland” was filmed. I’d get to visit Devil’s Bridge Falls, where Detective Chief Inspector Mathias finds the body of the elderly woman whose teeth had been yanked out with a wrench. Paul was less excited about that than the rest of the trip. If you are, as I was, unacquainted with Welsh footpaths, you’ll find one aspect of the Offa’s Dyke Path shocking: huge portions cut through private property. I don’t mean remote, overgrown, acreage you’d traverse unnoticed. I mean this: You walk directly up some family’s driveway, past their Peugot and tricycles, beneath the underwear pinned to their clothesline, and across the back yard, where, for example, a shirtless man might be enjoying a cocktail. You walk through pear orchards and cornfields — not along the edge, but right through the cornstalks — and countless sheep and cow pastures. (The sheep scatter; the cows, disconcertingly, stand their ground.) Twice we ventured onto the fairways of private golf courses. The path once led us through the outdoor lobby of an industrial tire store. But the Welsh aren’t bothered by intruders with day packs. It’s true: Legally, the Welsh are required to let the likes of me and Paul troll the garden. What’s more, land owners must keep their path segment “accessible and safe,” lest the trail authority bill them for repairs. When you’re not crossing private property, you’re often walking on paved public roads. Which brings me to the second most shocking thing about the path, at least for those of us raised on superhighways: the roads are so narrow and empty you think you’re ambling along a jogging path. But then some oddly shaped European car comes barreling around the bend, and you narrowly escape death by plastering yourself against a prickly, 10-foot hedge. Our days on the Offa’s Dyke Path followed a similar rhythm. We’d wake around 7 a.m. and step gingerly on the floor, surprised our feet had recovered from the previous day’s pounding. An hour later, we’d devour our “full Welsh breakfast”: one fried egg, two pieces of bacon, one sausage link, grilled tomatoes, and sautéed mushrooms. Occasionally this was served with laverbread, seaweed boiled to a bitter pulp. What’s important to know about these packed lunches is that they’re entirely inadequate. Clearly, the B&B proprietors along the Offa’s Dyke Path have never actually walked it; otherwise they would not starve you with a meager sandwich, miniature apple, and 1-ounce bag of chips. By day three, I’d learned to say, “Whatever you’ve planned for lunch, please double it!” I must have sounded desperate — one proprietor packed us six sandwiches. We ate them all, along with our emergency stash of shortbread cookies. Mornings were the best. We’d set off energized, eager to see what the day would bring — mostly pastures, throngs of sheep, and stone cottages, but also surprises, like a pack of yodeling men with large hounds, on the hunt for rats and rabbits. We’d finish around 5:30 p.m., feeling a sense of grand accomplishment, and spring to life after a hot shower. Most nights we’d dine on steak pie at a pub, exchange foot massages, and crash. Given the interminable stretches of pasture along the Offa’s Dyke Path, you could easily find yourself lost in thought. I suggest avoiding this for one reason: you will get lost. You’ll probably get lost, anyway, because the Offa’s Dyke Path is not a path in a literal sense. It’s visible only on a map or on your phone via the British Ordnance Survey map app. The only tangible indication you’re on track are wooden posts, affixed with decorative acorns, spaced about every quarter mile. Alas, you might not notice the acorns — not if they’re obscured by a hedge or the post has fallen. If you’re wondering why you can’t just follow the hikers ahead of you, it’s because there won’t be any. The Offa’s Dyke Path, to the benefit of its travelers, is not wildly popular. Our B&B hosts told us they receive 6 to 10 walkers a week. We did come across day hikers and packs of teenagers on short overnights, plus four walkers heading the opposite direction. But the only walkers traveling our way on a 12-day plan were two maddeningly fit German women. We’d stagger into a B&B, grubby and spent, just as they were returning from dinner, pressed and coifed. Or we’d spot them ahead on the trail. “Look — it’s the Germans!” I’d say, picking up our pace only to watch, demoralized, as they’d fade into the distance. Pretty much the only evidence that people regularly hike the path can be found in the church guest books. Paul was cranky that day because we’d traversed several backyards and long stretches of paved roads and had encountered deafening farm equipment, a far cry from his serene mountain treks in California. It’s true — the Offa’s Dyke Path does not offer 14,000-foot peaks or expanses of solitude. But what it offers is better: an intimate encounter with local life. Paul’s favorite parts of the path were the wooded stretches, far from the speeding Peugots and bleating sheep. What I liked most were the 400 gates we opened or climbed over, separating one property from the next. To Paul, the gates interrupted our flow. To me, they were a psychological boost, proof we’d completed another segment and were that much closer to the evening’s steak pie. I also got a boost the few times I heard Welsh spoken. Only 19% of Welsh citizens speak the language, though street signs in Welsh abound, thanks to a government campaign to save the language from extinction. Our B&B host in Monmouth denounced the signage campaign. Perhaps what I enjoyed most about the Welsh countryside was how old everything was. A trailside historical marker might span five centuries in a single sentence, recounting the granting of a lordship in 1282, a 1536 castle refortification, and a 1789 act of Parliament. On the final day, we followed the Offa’s Dyke Path to its end, at the shore of the Irish Sea. There we ran into the Germans, who had, of course, already showered and eaten. The next morning, we boarded the train to Aberystwyth, a town far less bleak than depicted on “Hinterland” but worth visiting, anyway, for its seaside promenade. From a gift-shop owner, I learned I was not the only tourist to have been lured by the show. A Belgian man had become similarly obsessed and booked a trip for his birthday. “So two people in the entire world had the same idea?” he said. “Two that we know of,” I replied. In the end, even Paul got caught up in the “Hinterland” excitement. We took a 1920s steam train to Devil’s Bridge Falls, where the show’s gruesome first episode was filmed. It was Paul who first spotted the bridge. Celtics Trails is one of the longest established walking holiday providers in the UK. 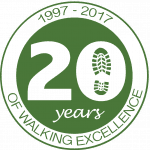 They cater to walkers who expect extensive local knowledge and a high standard of personal service. Over 70% of clients come back to complete another walking holiday, with regular faces reaching their 6th, 10th and even 12th walk. Post published on: March 26, 2019. Last modified: March 27, 2019.